In 1988, Soichiro Fukutake, then president and representative director of Fukutake Publishing (now Benesse Corporation), approached architect Tadao Ando and told him that he wanted to create a “utopia” in Japan. He explained his idea of transforming the neglected, economically poor islands of the Seto Inland Sea in Kagawa Prefecture into a “paradise” that would host world-famous artists’ work for everyone to enjoy — and in doing so revitalize the area. He asked Ando to join him in his vision. Yet this year, the Setouchi Triennale, which includes the work of renowned artists displayed in locations across 12 islands, celebrates its second incarnation. And the architect who said “no” now finds himself introducing his eighth creation for the island of Naoshima — the Ando Museum, a celebration of his commitment to Fukutake’s project. The new museum, which opened in March, appears to be a humble addition to the island. 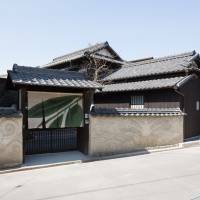 Housed in a 100-year-old traditional Japanese building in the town of Honmura, it is indistinguishable from similar nearby structures aside from a cream noren curtain illustrated with large green leaves, that hangs at its entrance. Being a former family home, it’s also merely 114.43 sq. meters, something that Ando later explained by email makes it all the more accessible to the public. But, as is always the case with Ando’s work, the museum’s appearance is deceptive in its simplicity. 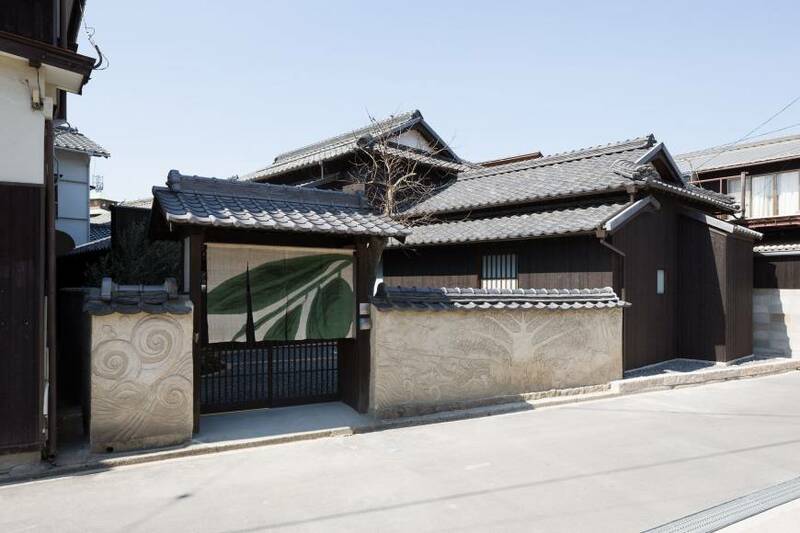 As a project conceived to not only double the life of the century-old building but also pair Japan’s traditional aesthetics with modern design, the construction involved renovating the original exterior of the house while completely re-building its interior. Even unavoidable replacement parts, such as roof tiles, had to be as close as possible to the original in material and age. “I believe that architectural Japanese technology is unsurpassed in the world,” Ando said as he explained his insistence on using traditional woodwork alongside his innovative concrete construction. And, just as he said, the compact space allows visitors to appreciate such skills upclose — the seamless carpentry of wooden beams contrasted against smooth reinforced-concrete slabs and pebbled floors. As has become expected from Ando, natural sunlight is used to illuminate the exhibits, which for the inaugural show trace Ando’s work in Naoshima — from his initial involvement in the creation of a children’s camping ground in 1989 to the museum itself. Sunshine seeps in through a long skylight and bounces off angled walls to illuminate documents, diagrams and models in a gentle, intimate hue. The exhibits on display not only illustrate Ando’s commitment to the island but also reveal the history of Naoshima, with photos of periods when saltworks and later copper-smelting foundries brought it prosperity, through its decline and Fukutake’s involvement in its revival. It is in the two basement floors, however, that the concept behind the museum becomes particularly apparent. A model of Ando’s 1989 Church of Light in Osaka, one of his most famous works, underscores his commitment to bringing humans together with nature and spirituality, while the model of Row House in Sumiyoshi, one of his earliest concrete buildings, set in the middle of a row of dilapidated Osaka townhouses, reminds visitors of Ando’s ability to draw attention to and harmonize his work with local architecture and culture. The exhibition culminates with a small darkened space, lit by a halo of natural light that glows from the ceiling. This is perhaps a manifestation of the “utopia” Fukutake had hoped for. A world-famous artist’s work that not only involves visitors intimately with Naoshima, physically and culturally — but one that also reminds them of the island’s, and their own, significance in the world. The Ando Museum is open from 10 a.m.-4:30 p.m., closed Mon. ¥500, or free with a Setouchi Triennale passport. www.benesse-artsite.jp/en/ando-museum The Setouchi Triennale runs till Sept. 1, with a fall session from Oct. 5-Nov. 4. A passport costs ¥4,500 and provides free access to festival works as well as discounts for related museums and projects. For more information, visit setouchi-artfest.jp/en/tickets.